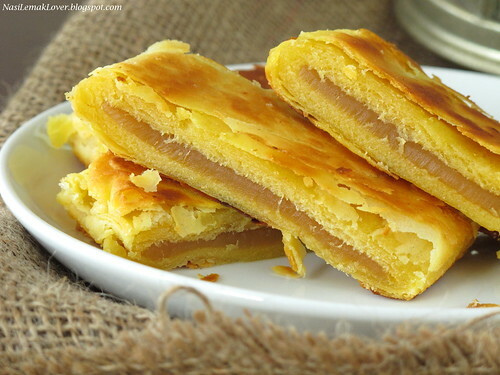 Curry puff ( It is a small deep-fried pie consisting of specialised curry with chicken and potatoes ) is a very common snack in Malaysia. 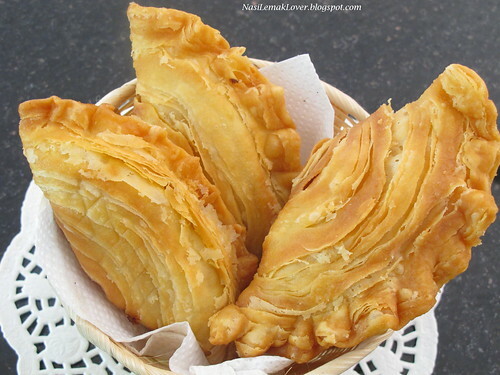 Today i not going to share with you the normal curry puff but instead I'm sharing with you this special spiral curry puff (inspired by Jane's corner as she recently brought a big box of spiral curry puffs to school and was well received by all). 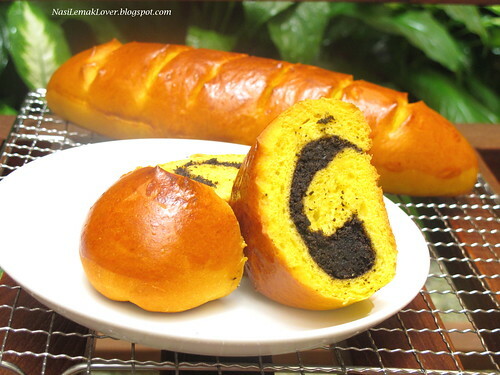 The other day i bought a half pumpkin, and I use it to make this Pumpkin black sesame bread, pumpkin butter cake and steamed savourty pumpkin cake. I agreed pumpkin is a very versatile ingredient, we can use it for cooking or baking in many ways and methods. My daughter just told me this spaghetti is so so good ! 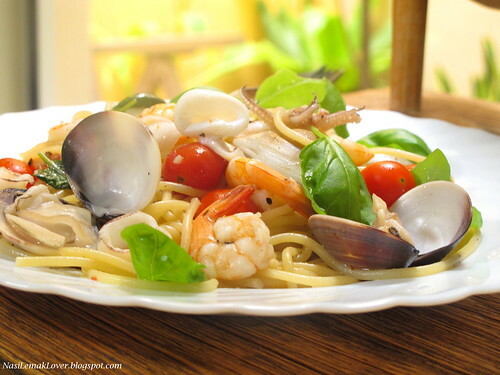 I just cooked this spaghetti for lunch today, and my daughter always the first person who enjoy the lunch as her class start at afternoon. 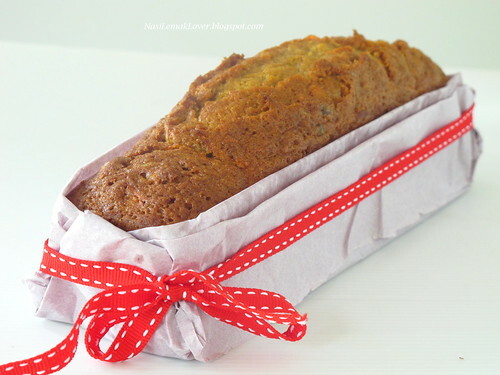 Carrot cake is my all time favourite cake beside butter cake. After i tried the Quay Po Cook's carrot cake with cream cheese frosting, i totally fall in love with this cake, a perfect carrot cake recipe. Earlier i did not serve carrot cake with cream cheese frosting, after i tried with cream cheese, I know i will not miss to prepare cream cheese frosting whenever i bake a carrot cake next time, they are the best combo! Last weekend, i brought this cake to a "gang dinner" at a Korean BBQ restaurant and all my girl friends were very impressed with this cake. I attended a free cooking class few months back which was organized by the housing developer in my area, quite often they have this kind of free cooking class for residents (we can also bring friends along)..That class i attended was conducted by the Malaysia's celebrity chef Florence Tan. 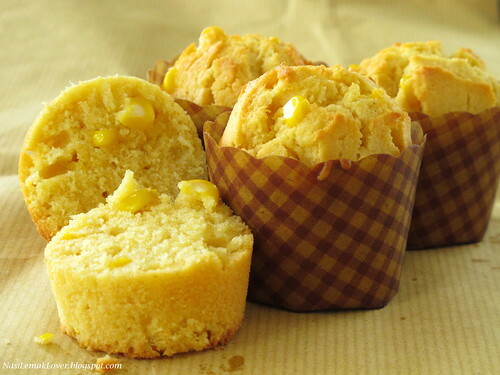 Thanks to the recent popular 7-link tag game, and i got to know this Kenny Roger's Corn muffins at Kitchen Flavours's blog as this muffin is her most popular post. I use the leftover lotus paste from the mooncake making to make this Lotus pancake. 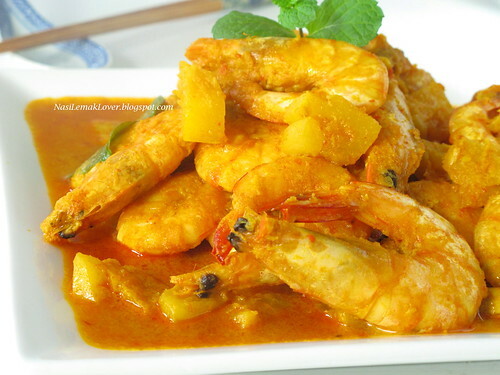 This lotus pancake is usually serve at the end of a Chinese wedding dinner, a symbol of sweet ending. Before I go to Shanghai China, i have no idea where to visit and places to eat. I tried to search in my blogger list, it seem not many bloggers visit to Shanghai except Terri and later she gave me her daughter Yi contact no. 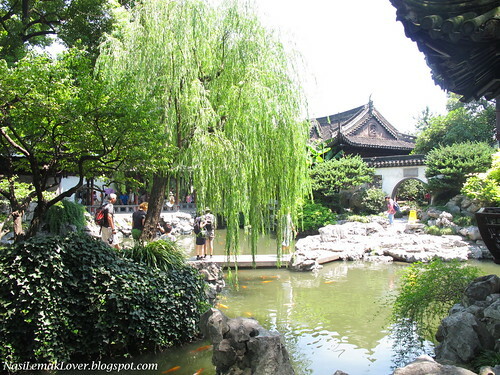 Thanks to Yi recommended me Yuyuan garden, a place must visit if you happen visit to Shanghai. Actually the hotel that i stayed is very near to this garden, less than 5mins by walk. This will be my last batch of mooncakes for this year, adapted from the famous recipe 鲸鱼蓝蓝蓝. This year I really rajin (hardworking) and crazy making mooncakes, personnaly i did not eat much of mooncakes, most of it are giving out to relatives..Traditional mooncakes and Flaky swirl yam mooncake were my 1st time trying except snowskin mooncakes. 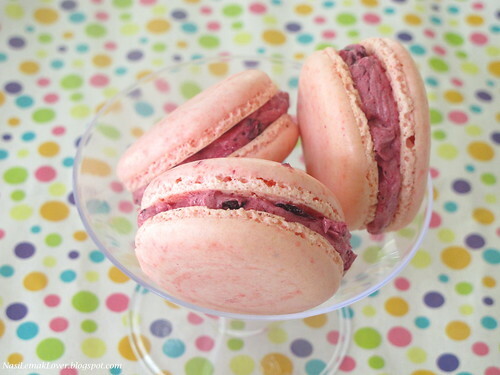 With this new Shanghai mooncakes, this year i have done three type of most popular mooncakes. Mooncake again? 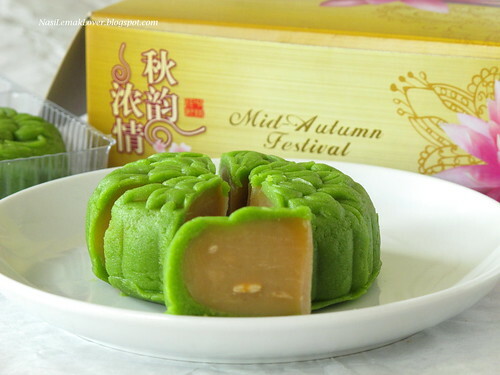 yes, i think this week you have to bare with me, I need to finish post the mooncake before this festival end on this Sunday. 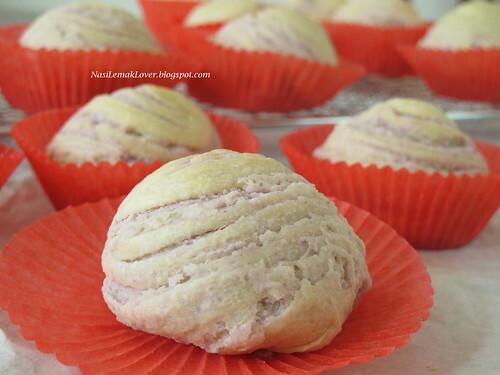 When i saw Terri recommended this good swirl taro mooncake, immediately i start to look for good taro like Pinang taro to make this mooncake but unfortunately i couldn't find in few wet markets. I ended bought taro from Thailand, actually the taste is not bad and it has the fluffly (sang in Hokkein) texture. 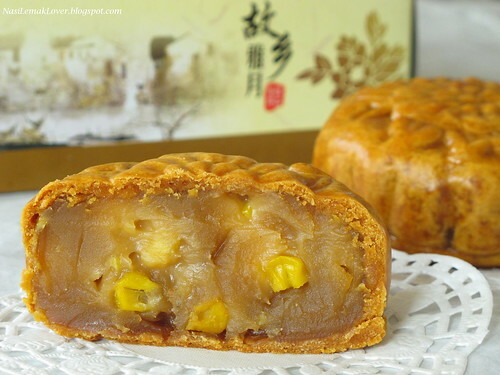 I tested a similar corn and lotus paste mooncake in the hotel where i stayed during my recent visit to Xiamen China. Something difference from the usual traditional baked mooncake which normally adding melon seeds. 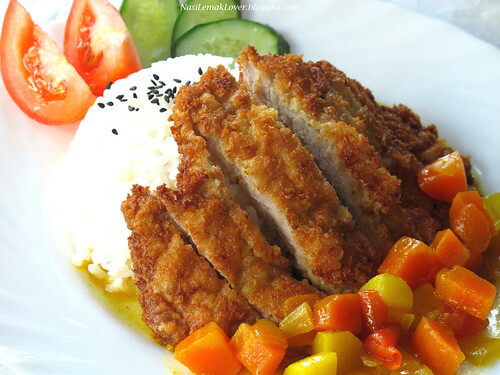 I prepared this fried pork chops and curry rice for yesterday dinner, very similar to Japanese pork and curry rice. But I couldn't call this as Japanese pork and curry rice because i did not use Japanese curry paste. My son Lucas prefers snow skin mooncake, i made this green tea mooncake for him as he also like green tea flavour. 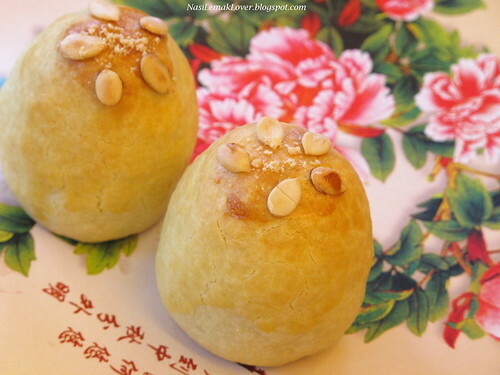 Snow skin mooncake is quick and easy to make, definitely more simple than traditional mooncakes. After we finished visited Yu Yuan garden and tried that famous Nanxiang steamed dumplings, we walked back to our hotel (just nearby) through a back lane..While walking back, we spotted a simple Jiaozi (dumplings) shop and we decided to give a try since we were not so satisfied with Nanxing dumplings. 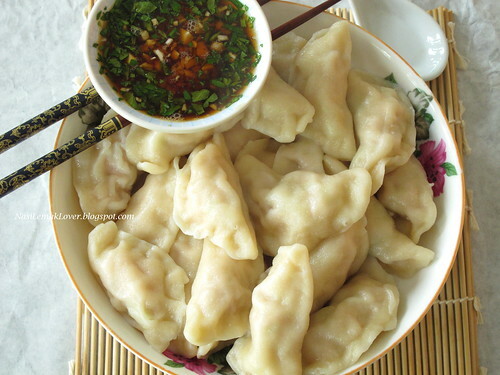 We were so happy after tasted their Jiaozi, it was so fresh and yummy.